Is there a simple way to “sweep” leftover money from multiple envelopes into another envelope after bills are paid and some funds still remain at the end of the month? For instance, say I budget $300 for electricity, $100 for cell phones, and $75 for the water bill each month. But this month the bills only come to $250, $75, and $55 respectively and $50, $25, and $20 is then left over in those envelopes. I’d like to move all of those leftover funds into another envelope (say, “Savings”) at that time. Of course, I could do several individual transfers from envelope to envelope to accomplish this. I’m just wondering if there’s a way to sweep them all out at once that I just don’t know about yet. Sure there is. This method is sort of an undocumented feature, but I’ve used this method a few times myself. Basically you would want to select your savings envelope, or the envelope you want to sweep funds into, then click the allocate button. Now, instead of entering amounts to allocate from your savings envelope, enter negative amounts to pull funds from other envelopes into your selected envelope. 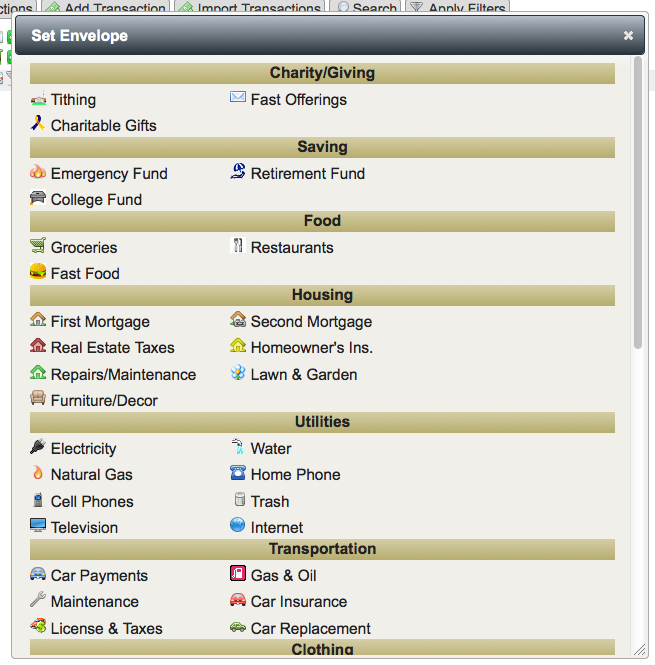 What is the best way to manage cash envelopes as well as my checking account’s envelopes? I have a lot of savings accounts that I essentially treat as folders. I have an automated savings plan for most of these. There are then many transfers in from checking each month and 1-4 out of these each month. How do I handle all those ins and outs in Inzolo and still have correct accounts and envelopes? The answer to this is essentially the same as how I handle using credit cards with Inzolo. If you are tracking each savings account in Inzolo, when you make a transfer you should have two transactions that are imported – one for the withdraw and one for the deposit. I have a created an envelope called “Bank Transfers”. This is where I keep all these transactions for auditing purposes. I put both the deposit and withdrawal transactions in this envelope. 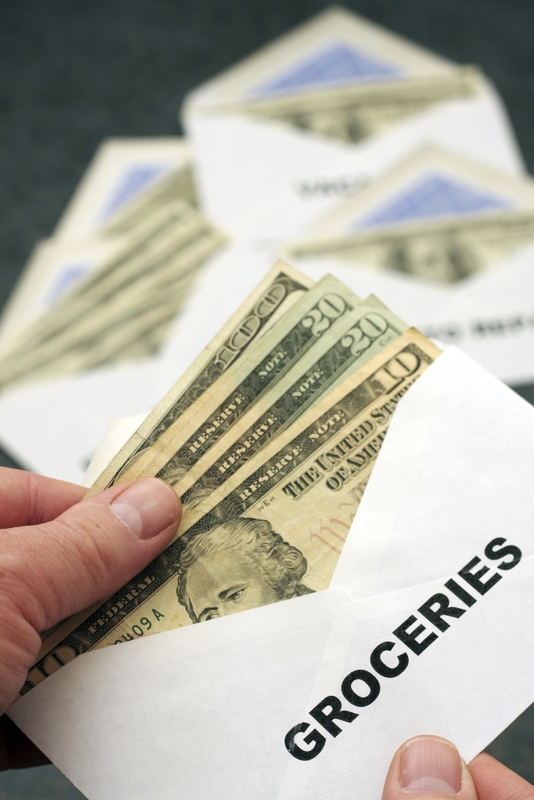 Envelopes are not tied to a particular bank account by design. I did this because I may spend grocery money from my debit card, or from a Costco AMEX card. I wanted both funds to come out of the same envelope. If you have an envelope that represents a savings account, you would just keep that balance in sync manually by transferring or allocating the funds you need within Inzolo. Note that there is a feature request in the feature voting system to add this account transfers envelope automatically if you are tracking more than one account. I will likely add this feature at some point in the future, but for now, creating a envelope yourself is the workaround and only needs to be done once. 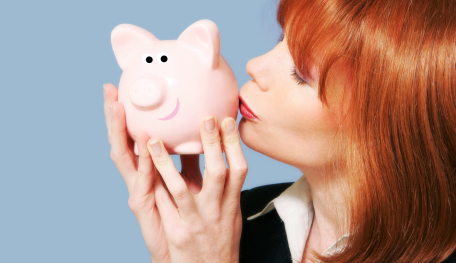 Tip: I used to have a few savings accounts with my bank to help me separate my emergency fund & other savings. Once I started using Inzolo, I stopped using these separate bank accounts because 1) I wasn’t really earning any extra interest worth the effort of transferring funds, 2) I didn’t need them anymore. I look at my bank account as a big pile of cash. Inzolo is the method for me to organize that pile of cash. I don’t really look at my bank account balance anymore other than to verify that it matches my envelope balance. 3) It wasn’t worth the time I spent making the transfers (I didn’t have any automatic transfers set up with my bank). This is just a quick update to let you know that I have increased the commission percentage for Inzolo affiliates to 60%. This is lifetime commissions. What does this mean? 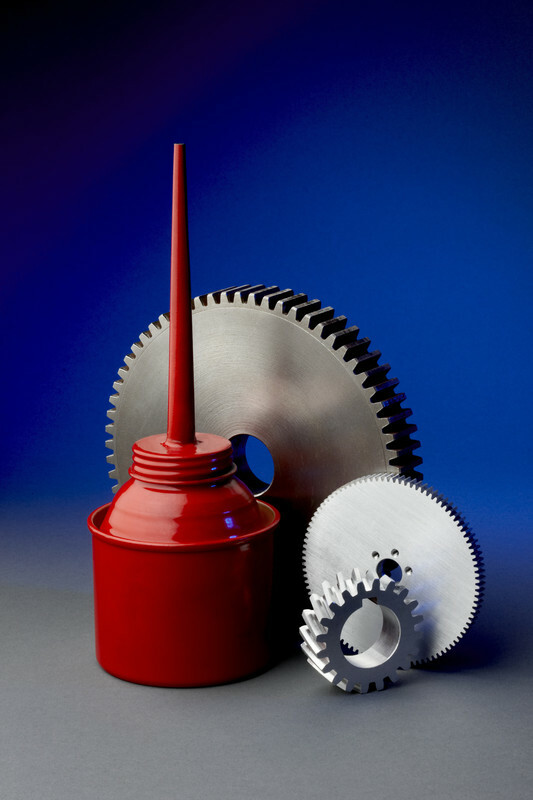 If you sign up for the affiliate program (absolutely free) and refer just two budget pro members, that will more that cover the price of your pro membership. Any others you refer after this is gravy to help add some funds to your budget! I just noticed that adding & editing transactions on the mobile app broke since my last big update. I fixed that today. While I was in the code, I updated the jQuery Mobile framework to the latest version which should hopefully add a few improvements. I’ve been using Inzolo for 3 years now and recently some balances got out of balance. You should often check to verify that your envelope accounts total matches your bank accounts total. To see this, scroll down to the bottom of your envelope list on the budget screen. 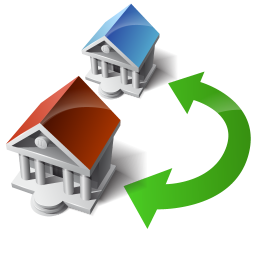 If you have any unassigned transactions, verify that “Account Total” from envelopes matches “Accounts Total” from bank accounts. If you don’t have any unassigned transactions, make sure “Envelope Total” matches “Accounts Total”. Unfortunately I don’t know how things got out of sync. I’m still testing and looking for the root cause. If anyone notices anything similar and you can reproduce it, please let me know! In the meantime I had the task of getting things back in order. In the process I found things could be made simpler when trying to track these things down so I made a few updates that should help if you find yourself in the same situation. 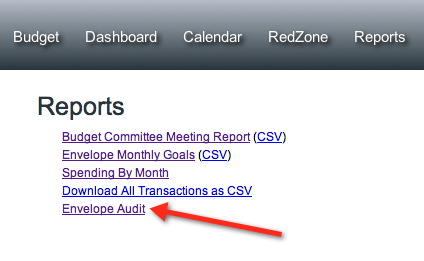 First of all, in the reports section I’ve added a new report called “Envelope Audit”. This tool will show the balance currently set for the envelope, what the envelope amount would be if you total all the transaction amounts that are assigned to that envelope, and the difference between the two. If you are a strict budgeteer, the difference between the two should be zero. I found a few of them where off, so I manually edited the envelope balances to match the transactions balances. I had to pull a couple of envelopes out of the archive to update them. Another update I made that was suggested on the Feature Vote system was to retain searches and filters when jumping from envelope to envelope. So if I click on an envelope, then change the filter to view all transactions, then click on another envelope, I would still have the filter set to view all transactions. Once I got all my envelope balances in sync, I found a large discrepancy in my unallocated income folder. This is not really a big deal, but I wanted to fix it as well. I had to make a few hacks in the system to make this work. First I tried adding a transaction with no bank account assigned. I found a bug where this transaction ended up in no man’s land because it it didn’t have a bank account or an envelope – the two ways a transaction is associated with a user. So I updated the system to assign transactions to the Unallocated Income box if you don’t select an account. Note that if I choose to undo this transaction, it goes out to no man’s land again. Basically just consider it a way to delete these hack transactions. So after I added my hack transaction to get my unallocated income balance to sync, I now needed that unallocated income balance to equal zero again. So I added one more feature to allow you to manually set the Unallocated Income folder balance. To do this, click on the edit envelope button and you will be prompted to enter a balance amount to set. I understand I’m airing dirty laundry here and it may feel dirty to make make manual modifications. Technically the system should be solid enough that things don’t get out of sync. But until I’m a perfect programmer, if you find yourself in an out of sync mode, hopefully these new tools will give you the ability to set things straight. When I first created Inzolo, I thought it would be nice to have a way to set up filters to automatically assign transactions to envelopes based on filter rules – much like you can set up filters in email applications like gmail. Since someone else suggested it and this feature request got pushed to the top of the list in the feature vote system, it became top priority. In order to auto-assign transactions, you must first create an auto-assign filter. You can create filters by going to the Filter Rules menu option. There is also a shortcut on the Unassigned Transactions list. If you click on the [ ] icon, it will take you to the add new filter view and pre-populate the payee and memo fields with the transaction payee and memo fields. Rules are very basic and simple. 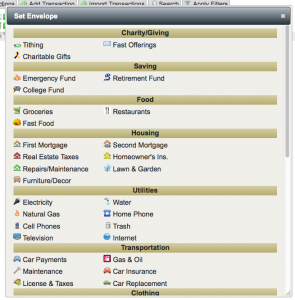 Enter text in the Payee and/or Memo fields. If a transactions comes in that contains the text in the payee or memo field, then it is assigned to the envelope you select for that filter rule. The verify checkbox provides a way to see what will be auto-assigned before it actually happens. I personally prefer to leave this checked for every rule because I like to see every transaction that comes in. Now, you have the option of first verifying the envelope assignment. If you click the accept button [ ] then it will be assigned to the Groceries envelope. But, as is often the case with stores like Costco, Target, Wal-Mart etc., this may not be groceries. You may want to move it to a different envelope or split the transaction amount multiple envelopes. Pro Tip: Notice the accept button on the table header. If you click this accept button, it will accept all pending envelopes in the unassigned transactions list. Don’t worry, as always, if you make a mistake assigning a transaction to the wrong envelope, just click the envelope to view the transactions and click the undo button [ ]. It is also important to note that the order of filters is significant. Let’s say you also purchase gasoline as Costco. You could create a filter that has “Costco gas” in the payee field and goes to a Gas/Oil envelope. Filters will be triggered in the order you see them in the list, so if your previous filter of “Costco” is listed first, it will trigger and the transaction would go to the Groceries envelope. So you would want to drag & drop the “Costco gas” filter rule above the “Costco” filter rule. This way, a transaction that has the payee as “COSTCO WHSE #0487 00SANDY CITY” for example, would not trigger the “Costco gas” rule and be assigned to the Grocery envelope, while a transaction with the payee of “COSTCO GAS #0733 000LEHI” would be assigned to the Gas/Oil envelope. Now, while we are on the topic of saving time and assigning envelopes, there is another little feature I have added to give you an alternate method for assigning envelops. If you click on the pending envelope icon, or, if there is no pending envelope, you can click on the assign envelope icon [ ] to bring up a pop-up dialog box with all your envelopes. Note: It may not be obvious from the screenshot, but this list is scrollable if all your icons are not displayed. The drag and drop is nice, but I will probably find myself using this new method of assigning envelopes far more. What about you? Do you think you’ll prefer the old drag & drop method, or this new method? I’ve added a new report to the reports section: Spending by Month. The report will let you select a date range, then show your spending for each month in that range, along with totals and averages. It’s as simple as that. Not much else to say. 😀 Go give it a try.